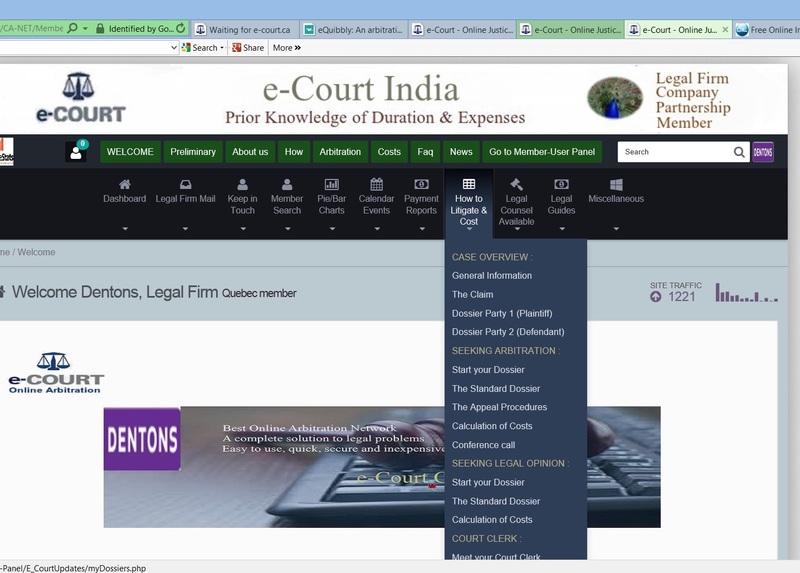 e-Court India will re-shape the future of Indian Litigation. Forces transforming the legal industry promise the emergence of new models, such as e-Court that will allow clients to reap huge efficiencies. It took our IT development team five years and in excess of $3 million investment and growing, to develop a database which unravelled the legal complexities yet adheres to strict Indian legal laws. To our knowledge there is to-date no privately funded organization which is able to match e-Court's innovative database and other structures. 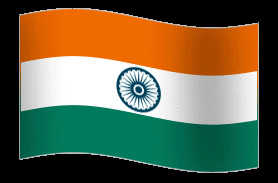 We can handle a minimum of #20,000 cases simultaneously; Welcome to India's most exciting non-governmental arbitration. Let us show you how ! Our Mission statement: e-Court India aims to be a champion for the consumer, achieving this by offering passionate and visionary values. These are: Value for Money: To offer honest, simple, and transparent pricing. Quality of Service: To offer services without compromising any of e-Courts values. Specifically to be professional and with unquestionable integrity. For the People: To offer conflict resolution services for everyone, not just those who can afford it. Challenging: To offer new and innovative ideas, to always push the boundaries of conventional thinking. Force for Good: e-Court would like to see itself as making a positive contribution to peoples lives and as a force for good. No hidden costs. We do not occupy expensive mortar and brick offices and we compensate our arbitrators with a just remuneration which pays the professional for their time and not for "pushing" paper work. The time an experienced judge and/or arbitrator spends on your case, is pure thinking, not paperwork. This saves in cost. A portion of the amount in contest ( called the escrow ) is deposited in an escrow account with the AXIS bank ( corresponding bank with BMO Canada ) prior to the start of the litigation process. The funds are immediately released when the verdict favors the Claimant or when against, deposits are returned to the appropriate parties. e-Court cases take no more than six weeks (excluding a possible appeal of four weeks). This makes the process to cost much less than ordinary courts, where to obtain a ruling takes on average between 70-90 weeks. 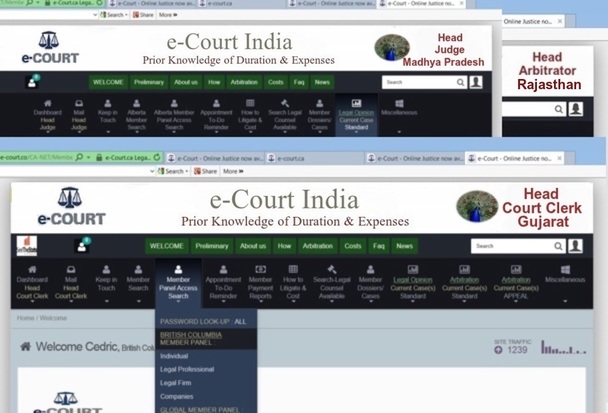 e-Court is extremely flexible because the individual or company can start a case using e-Court with/without the assistance of a legal professional. In many situations the claimant and/or defendant feel they wish to avoid legal expenses and obtain justice without expenses from legal counsel. However our members can always select a suitable listed legal professional. Members have full & complete control and 24/7 "in-sight" in all related records and in real time. 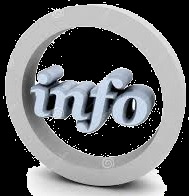 All members will have their own personalized admin panels with full search capabilities on a variety of exciting issues. In addition, they have an automatic membership in up to three e-Court country organizations. Socials are being held each month throughout the country, except during July and December when no events take place. 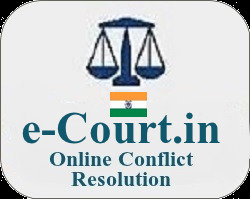 E-Court believes that aside from the many advantages that the internet offers, there is a big role for meeting "eye to eye" with legal professionals in a social setting. Often, a speaker is invited to address important widely ocurring legal issues. Socials are announced via email to all e-Court India members.The venue will be suitably located with adequate parking. We offer Integrity, Professionalism, Accountability, Security, Expediency, Transparency and Low Cost". Thousands of our endorsers can attest. What do you mean e-Court offers Integrity & Professionalism ? ANSWER : 1.e-Court abides fully to judicial ethical standards. 2. e-Court deals with a highly professional Directorate, Supervisory-Body, Advisory-Council. These officials are all selected by a Selection-Board who follow the strictest selection procedures. What do you mean e-Court offers Accountability ? ANSWER : 1. e-Court has engaged a Professional Chartered Accounting firm to conduct an annual audit of its financial records. Members are privi to receive the independent annual audit review reports. 2. Last but not least, our Management-Team has carefully chosen individuals who understand to operate in a virtual world. 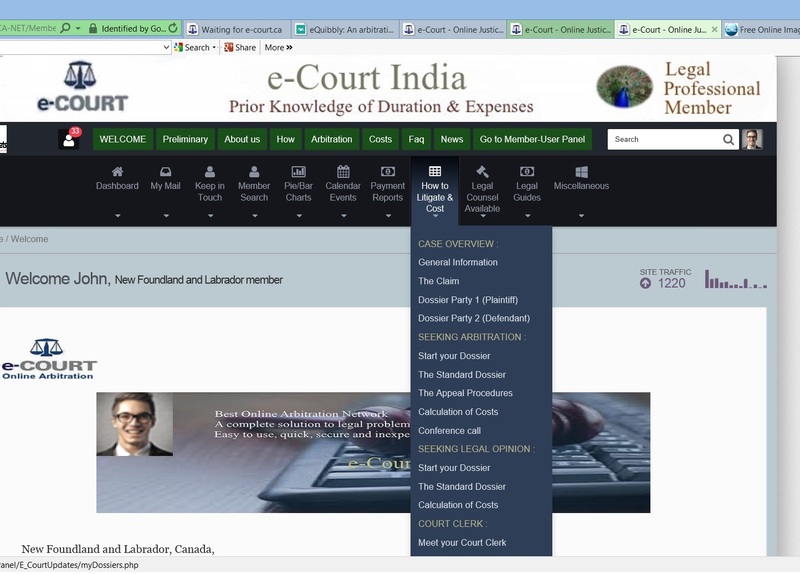 What do you mean e-Court offers Low cost ? ANSWER : 1. 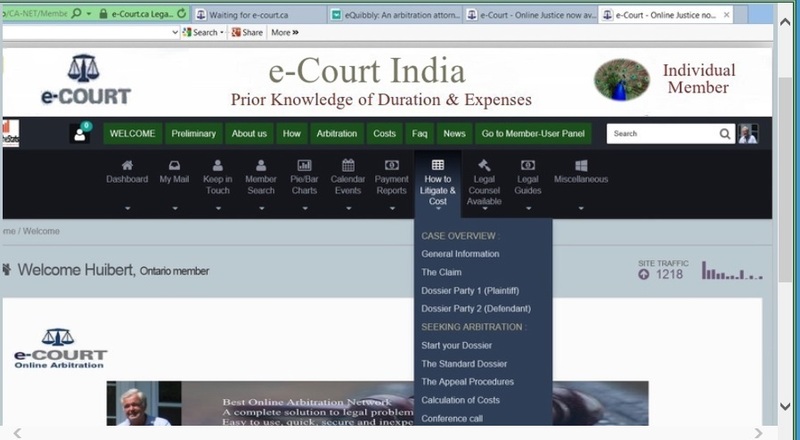 With e-Court, litigation costs Costs are reduced dramatically yet e-Court adheres to strict legal criteria. 2. Our Membership fees are reasonable and one-time "life-Time", without ambiguous rates resulting from undisclosed amounts from hours and/or other costs. 3. Your membership includes an automatic free membership with all e-Court organizations around the world. 4. We do not occupy expensive mortar and brick offices and we compensate our arbitrators with a just remuneration which pays the professional for their time and not for "pushing" paper work. The time an experienced expert judge and/or arbitrator should spend on your case, is pure thinking, not paperwork. This saves in cost. What do you mean e-Court offers Expediency ? 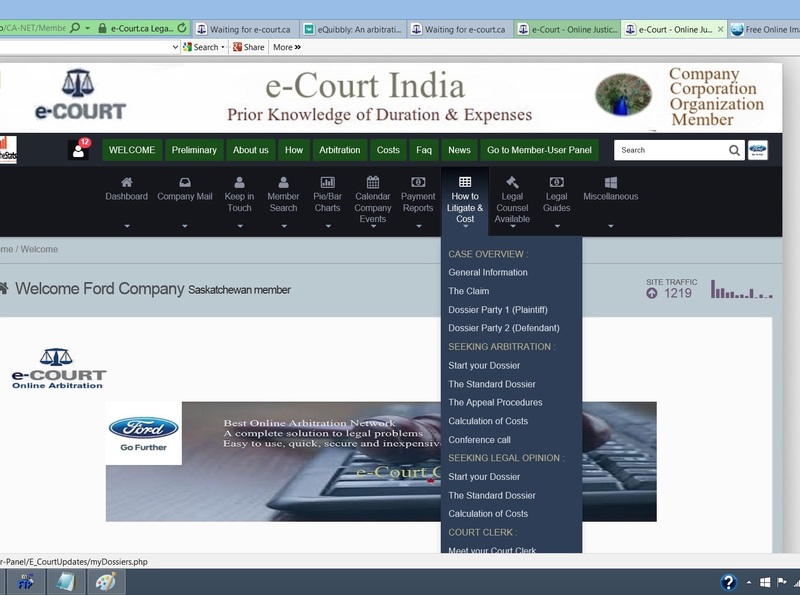 What do you mean e-Court offers Transparency ? ANSWER : Members have full & complete control and "in-sight" in all related member records "at any time". Groping in the dark. Did you know that more than 95% of all litigations never reach the traditional courts but get settled by both parties without upfront knowledge of size of legal fees and duration of negotiations, etc ? Does it not make more sense to settle disputes via e-Court where there exist full & transparent upfront knowledge of legal fees and duration for settlement ? What do you mean e-Court offers Security ? What do you mean Litigation costs with e-Court are known "upfront ? ANSWER : All Members will have access to the costing tables ( see above video ) and only need to tick the boxes relevant to their case. Thereafter the information is submitted to the Court Clerk for processing and further housekeeping. In a matter of days the Member is invited to commence with the case with the appropriate Judges and /or Arbitrators ready to assist. It is that simple !